They come from all over Nigeria and go by different names, speaking to their provenance, their source and origins. The tomatoes do. Names unpronounceable in some languages, where certain consonant combinations are never found. Like gb. Pronounced with force and confidence. And literally known as labial-velar consonants. Truly doubly articulated labial–velars occur as stops and nasals in the majority of languages in West and Central Africa (for example in the surname of Laurent Gbagbo, former president of Ivory Coast…. They include [k͡p, ɡ͡b, ŋ͡m]. To pronounce these, one must attempt to say the velar consonants, but then close their lips for the bilabial component, and then release the lips. Note that, while 90% of the occlusion overlaps, the onset of the velar occurs slightly before that of the labial, and the release of the labial occurs slightly after that of the velar, so that the preceding vowel sounds as if followed by a velar, while the following vowel sounds as if preceded by a labial. Gboko. Gombe. Jos. Zaria. The names and the sources get mixed up in my head. There are also UTC and Panchi. Or Panchy varieties. I’m not sure which one is the correct spelling, or where that variety comes from. But both are favoured for redness, firmness and taste. Panchi(y) tomatoes are mostly available in April, around Easter time. The UTC variety, identified as being good for tomato paste is a reddish fleshy tomato with stripes of yellow and low water content. Just like Roma tomatoes. What a surprise to learn all these things – I didn’t even know that tomatoes came from different cities in the country, with implied variance in quality and flavor! 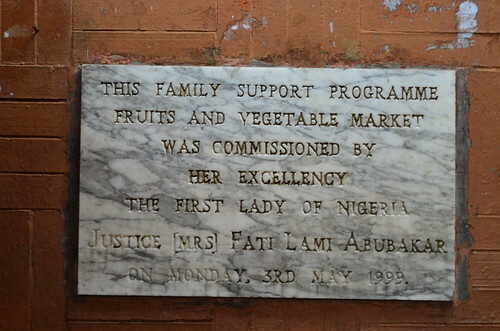 The supply at Fruit Garden comes from 4 principal production zones, concentrated in the north of Nigeria. 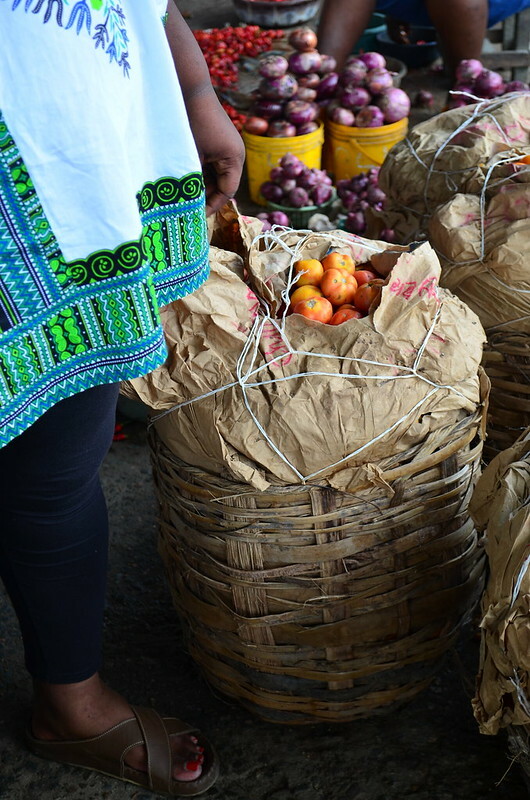 The tomatoes are available, at varying costs throughout the year, being more expensive in the dry season when irrigation is the main source of water supply, and cheaper in the wet season when the market gardens are rain-fed. 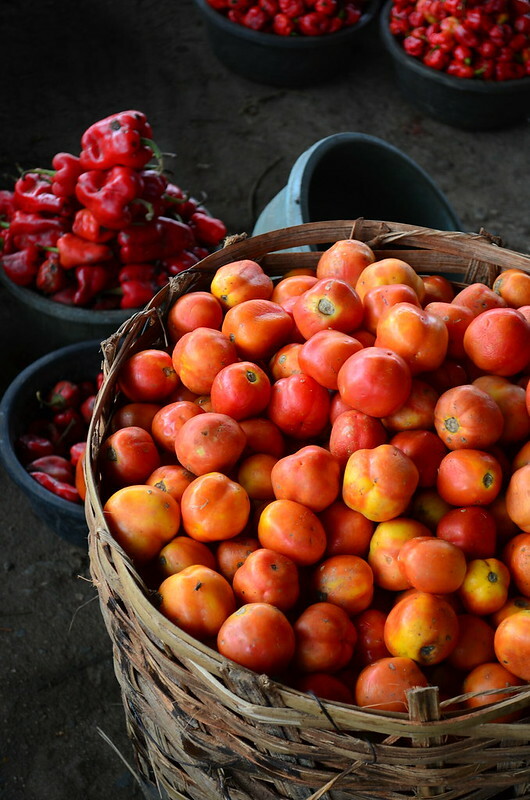 In January to June, the peak of the dry season, most of the tomato stock comes from the Jos Plateau, which also gives us tasty strawberries. 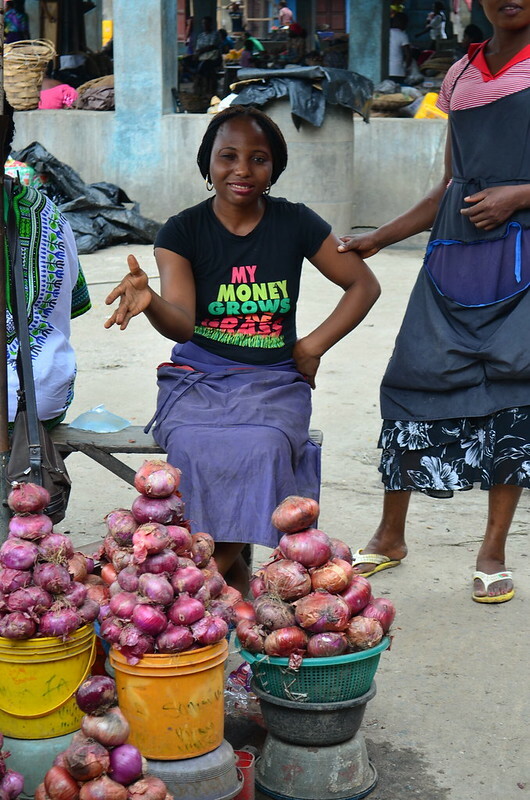 In June and July, the summer months of the world, Gboko tomatoes are the star of the rainy season. This time of the year, when the rains are still pounding down, and hard, the Gombe variety of tomato is common. From August to September you will find them, characterised by a dryness, without much juice and a firmness which makes them perfect for salads. 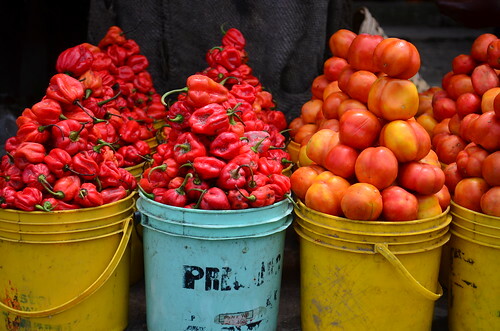 By the time the ’ember months truly roll round and Christmas is in the offing (October –December), oblong/oval tomatoes with pointed tips come from Zaria, perfect for making stews, and Jollof Rice. 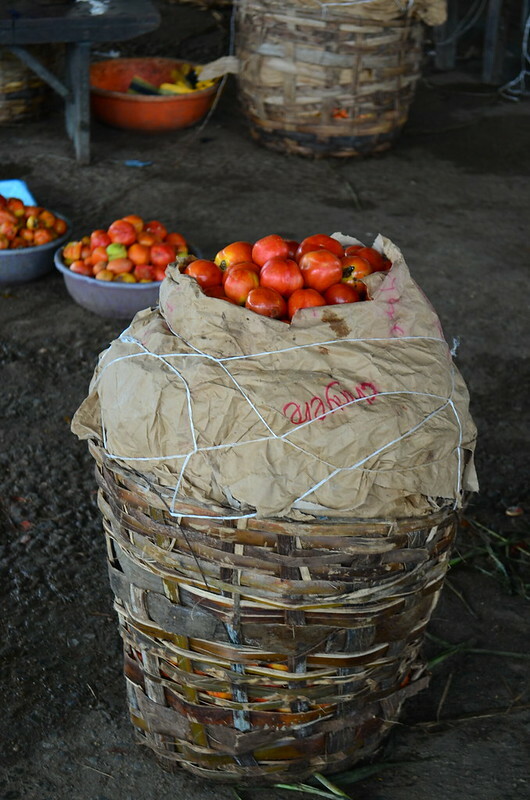 The tomatoes are usually harvested just before the market day and are packed in baskets made of bamboo. These are lined with dry grass and straw to cushion the tomatoes. Once baskets are full, they are covered with cement paper and wrapped with twine and then transported to urban markets round the country. Waiting to be sold to restaurants, and other ‘needy’ people! My mum says that lots of tomatoes get composted in the north, especially at this time of year when there is a ‘boom’ of produce. To be fair, tomatoes are perishable and with inadequate storage facilities, it is difficult to do more. That said, in some parts of the country, they are sundried for export. There is also an increased drive to can tomato paste of the excess! Afterall, Nigeria is second largest producer in Africa (after Egypt), producing over 1 million metric tonnes per annum. 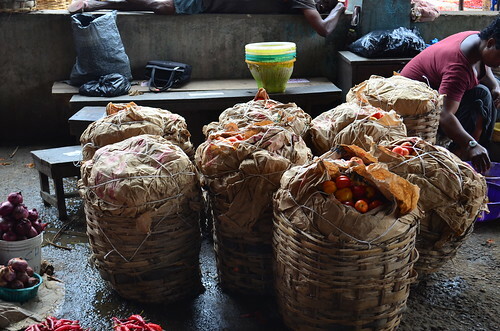 The tomatoes are sold in bowls and baskets by ‘volume’ not retailed by weights. 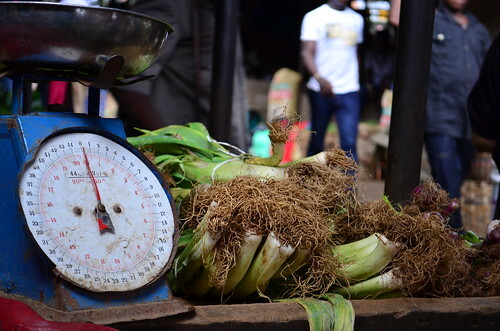 Traditional loose estimation measures that see lots of market products from dry goods to fresh vegetables and condiments sold in everything from margarine tins (Blueband), to plastic custard buckets. They are arranged in heaps and delicately balanced pyramids, and in all honesty could and often contain a variety of species, at various stages of ripening. I don’t do market visits often. I don’t do Nigerian market visits often. Out of pure necessity. First of all, the best times to visit them, whether in the week or at weekends are not convenient for me for full-time work leaves precious little time for weekend capers up and down market stalls. Especially in the rainy season. This area is equivalent to a quarter (1/4) of the size of The Netherlands, and a third (1/3) of Belgium, and is similar in size to the entire arable landmass in Laos, Bosnia & Herzegovina, Honduras, Somala, Latvia and the Dominican Republic! 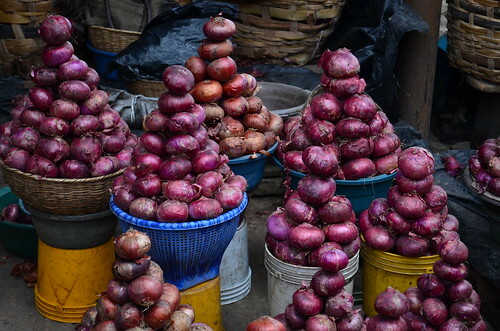 So, I haven’t been to a naija market in a year. But you’ve inspired me to and I’m mighty glad. 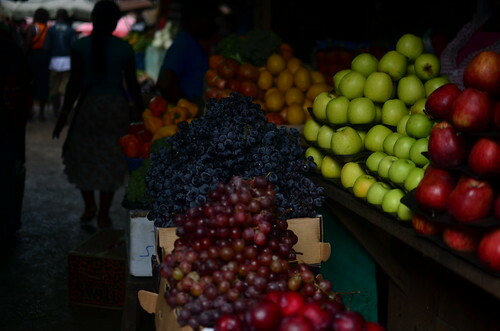 Determined to bring live photos from one of my favourite markets in Port Harcourt – known as ‘Fruit Garden’, I cleared out my agenda two Saturdays ago and made way, armed with courage and camera. Courage because Nigerians are naturally suspicious of snap-happy people who aren’t designated event photographers (taking photos at an event). Instead, they’re confronted with this weird looking woman in an afro, fabric flower in hair. Yes, I need courage, to tell them who I am and why I want to take photos that morning. To explain over and over again when faced with steely stare, that I am interested in knowing where my food comes from. And interested in learning from them. It’s the truth and most of them buy it. 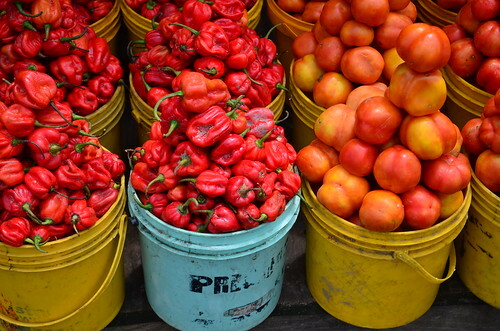 Even the ones who ‘do not want to be in the photos’ buy it and let me take photos of chili peppers and okra, onions and crayfish. 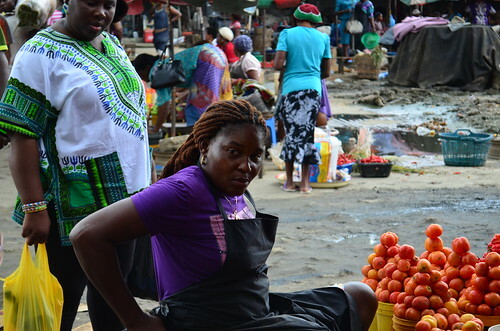 Market women are funny. Just like we are. The beauty is in seeing a full representation of society in a few square metres, from the easy going to the naturally suspicious, the superstitious and even the hostile-looking. I can tell all this by how they react to seeing me with a camera. Some let me know clearly even before I begin they won’t have their photos taken. Others think I’m taking the photos to London where I come from (re: afro and bloom in hair). Others are curious. ‘Who am I? Where do I come from? Why am I here, talking to them’. 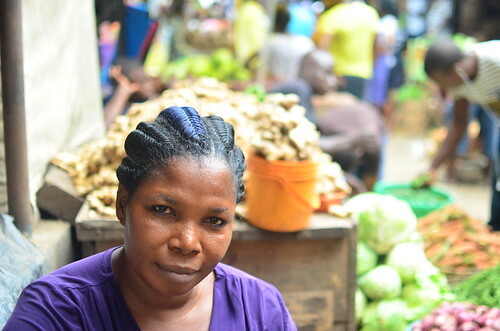 I speak pidgin (broken) English to them to show I may look different but I’m the same – I’m as ‘local’ as they come. Others are so happy to have their photos taken, they happily preen, and smile and are genuinely warm. They aren’t afraid of fame sweeping them off their feet. I promise them that the photos will be printed and brought to them. I am grateful. And make good on that commitment! While the photo-happy ladies ready themselves for stardom, I sense the ‘fangs’ of others – they catcall and ‘yab’ (tease) them. Jealousy, of course. ‘Monkey’ one shouts. And I’m in shock. I enquire, ‘Why?’ She mumbles some incoherent thing about how the lady (who is an adult, mind you) is posing for a photo. Something that’s entirely her own business. These are strange emotions for them and for me. Its not often they’re confronted with a camera, when they haven’t had sufficient time to prepare. Anyways, I love this pile of chillies – a bevy. The owner is the first to give me grace. She has sold all her major wares for the day, and its not quite noon. It might be why she’s happy to give me time. I love the blue in her extensions, and the intricate weaving. This is ‘very Nigerian’. In this country, women care about many things, especially hair. Yours and theirs. They don’t treat it casually. Its not something you forget to do at the weekend. Not if you’re a real woman anyways. And the beauty is – its cheap to get it done, and the styles are endless. From north to south, rich to poor, hair is a unifying force. I have a deep freezer full of hot peppers so I don’t avail myself of any and she doesn’t mind at all. My one weakness when it comes to chilies is for yellow peppers. 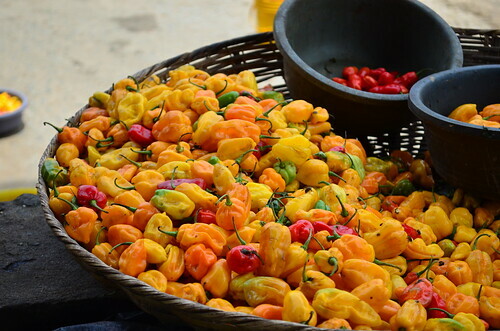 Hot yellow peppers. Peppers that come from the east of the country. Hot and fragrant is how I describe them. 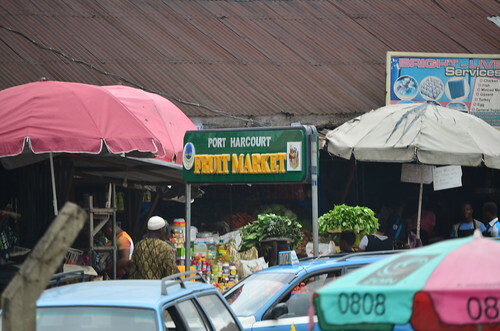 My journey begins with a stroll down the main thoroughfare of the market. First fruits – from Holland and South Africa are arranged quite beautifully, like a stall in Barcelona. I fall in love. But I move on, for the tomatoes, the baskets of tomatoes are to be found at the very end of the lane where bulk vegetables are sold. Tomatoes Onions, Chillies, Okro (Okra). The main thoroughfare is dedicated to fresh. Fruits. Vegetables. I walk past ‘fried rice and salad vegetables’. 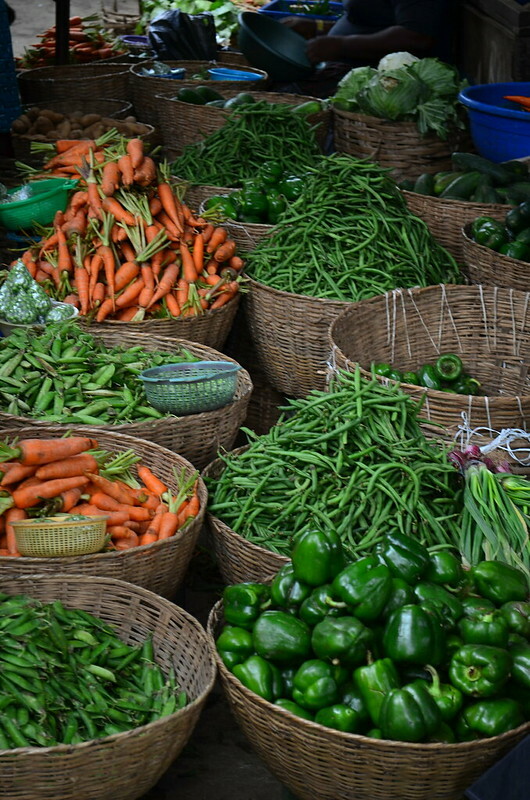 Carrots, green beans, peas, spring onions, cabbage, green peppers and lots more.These are mostly sold by weight, unlike their more elemental Nigerian compatriots – the tomatoes, onions and chili peppers. 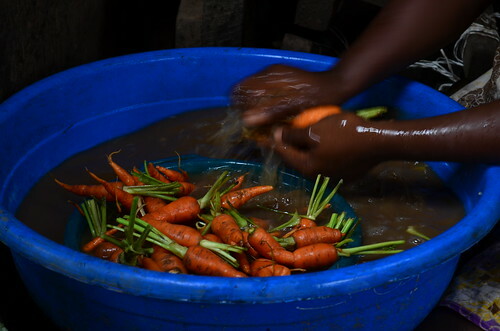 Ladies scrub the earth-cloaked carrots in water, and they come orange clean. Everything looks super fresh. Almost everything. Lots of stalls cut across the main lane, in a defined grid. Selling spices – curry powder, dried thyme, crayfish. 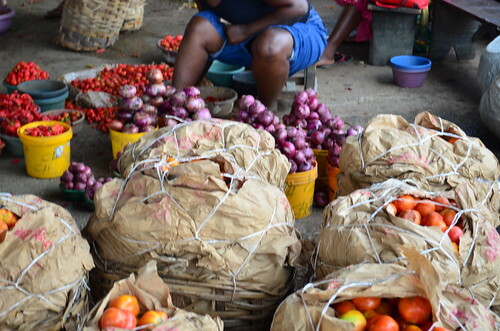 Vegetables, fruits, dried goods, flours, rice, beans, tomato puree. Scales are in righteous abundance, full of character and on duty. As are leeks. I love the purple onions, our standard cooking alliums. They are arranged in pyramids. Everything is arranged in pyramids. 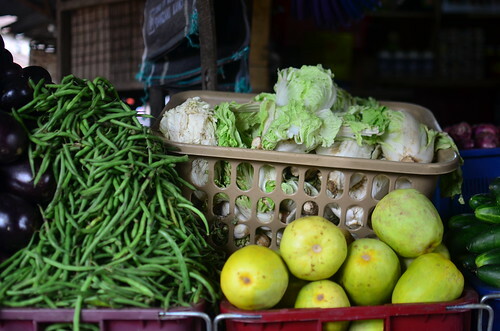 From the tomatoes, to chilies and onions….everything is in a mound, with price variations according to the ‘holding’ bowl or basket and equivalent height of mound. And then, right at the back of the market, I see the goods. And the women who I have to talk into giving me photographic rein. 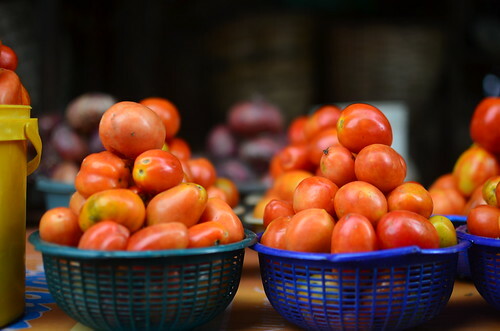 Its not everyday I have to explain about blogging, to tell them I love food and love learning about it, even if its commonplace things such as tomatoes. I tell them I want to photograph the tomatoes because nowhere in the world have I seen them sold in baskets this size. Have you? 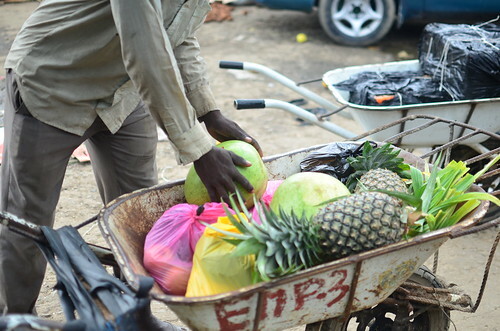 Each basket costs N8000 ($ 50 USD). The price has gone up in a mere couple of weeks. A few weeks back, my neighbour got a basket for half that price. In return, they tell me about the different types of tomatoes. Where they come from and which are their favourites. 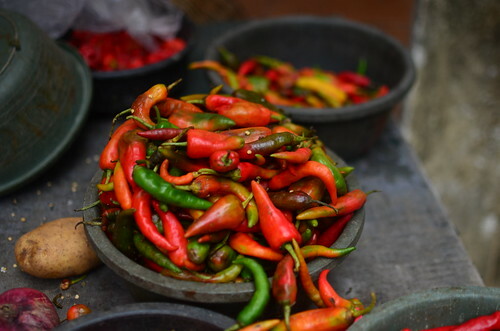 Once my wandering is over, my photos taken, I do some shopping, buying tomatoes, and some chillies, fruit for my sister and some for myself too. Then its time to go home, and I pile my wares into a wheelbarrow – a great way to transport all my shopping to the car park across the road. I’m spent, but thankful the skies haven’t opened up. Thankful that I’ve overcome my fear of approaching people. 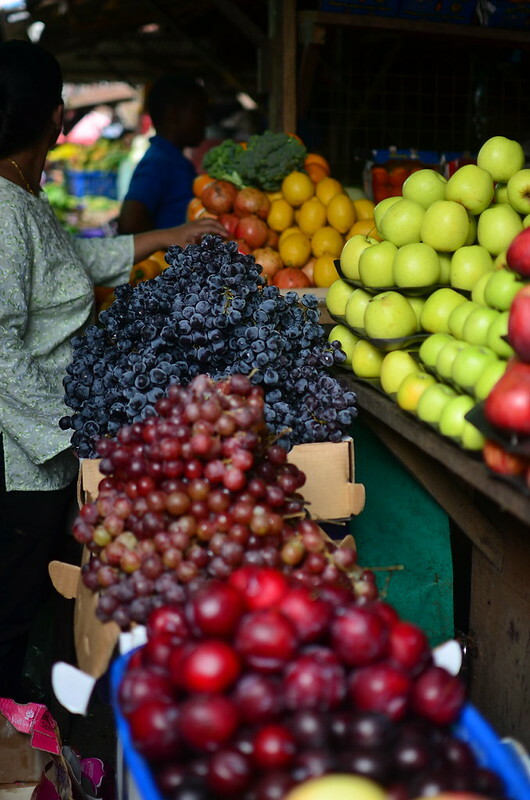 Thankful I’ve grown in using my camera, and most of all grateful to learn more and more about Nigerian agriculture and produce. Expect more ‘essays’ on marketplaces. Love from Brighton Beach (UK) where I currently am visiting a friend! PS, you can now PIN my photos if you like. I finally had time enough to find and activate the plug-in.